B&K Timber have over 30 years’ experience in crafting beautiful and durable bespoke timber gates. Our highly skilled craftsmen use only the highest quality timber and fittings, so you can count on us to ensure that choosing your bespoke timber gate is simply a breeze! If you’re looking for style, durability, and security, our bespoke timber gates are the perfect solution, no matter what your budget! Why Choose UK B&K Timber for Your Bespoke Timber Gates? With over 30 years’ experience in providing high quality, durable, and attractive bespoke timber gates, you can be assured that your new gate will be the perfect addition to your home’s exterior. Made to measure, and lovingly handcrafted from high quality Scandinavian timber which is FSC and PEFC certified, your new bespoke timber gate is built to withstand the elements and provide years and years of style, security and privacy. Looking for something on a budget? Our Sherwood bespoke timber gate, with its clean lines and simple design, provides the perfect balance of cost efficiency and style, without compromising on durability. Prefer something a little bolder? Your perfect match might just be our Astbury, Brereton, or Westport bespoke timber gates, with their panelling details. 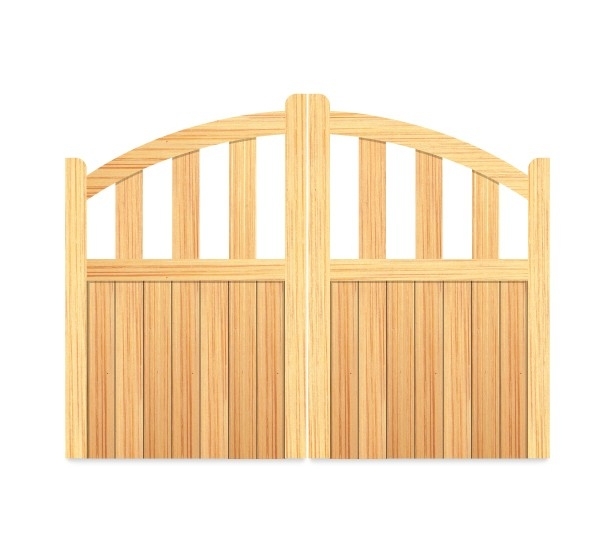 Whatever your style or budget, we have the ideal bespoke timber gate for you! Your driveway gate will often be the first aspect of your property that visitors will see, so why not let your bespoke timber gate make their first impressions great! B&K Timber have the perfect bespoke timber gate to complement any home, why not have a browse through our gallery for inspiration? If you’re ready to build your perfect bespoke timber gate, you can find our easy to use gate building tool here, or if you have any questions, feel free to get in touch!